Technology market intelligence firm TrendForce, or more precisely its DRAMeXchange division, has published what looks to be some good news for PC enthusiasts. Last year we saw signs that this might happen, but now some trends have been set in motion which should deliver "significant price declines for DRAM products during 1H19". In brief, there are both seasonal and oversupply factors in play here and it is possible that we will see PC DRAM price decline of 20 per cent or so by the end of Q1 2019. DRAMeXchange notes that Contract prices of DRAM products across all major application markets already registered declines of more than 15 per cent month-on-month in January, and they will continue their descent in February and March. If that is really the case then a 20 per cent drop in Q1 looks to be a guarded estimate. Looking ahead to Q2 2019 DRAMeXchange reckons the oversupply situation will persist and mainstream DRAM products will drop by an average further 15 per cent in this period. We all know new tech, especially new smartphone releases, can eat up available DRAM supply but demand related to 5G, AIoT, IIoT, and automotive electronics still is in the growth stage, while the smartphone market has decelerated as people hold onto mobiles for longer due to lack of innovation. It remains to be seen if Android phone makers can produce devices compelling enough at the upcoming MWC to spur a flurry of updates. 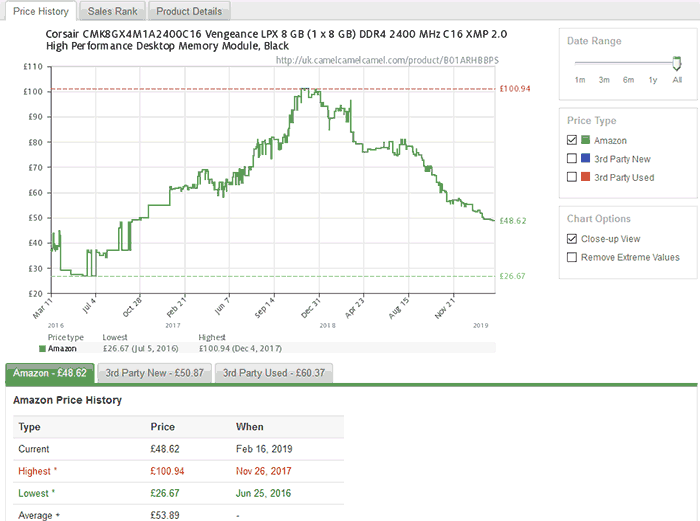 Considering PC market specifics, DRAMeXchange observes that the average contract price of mainstream 8GB PC DRAM modules is on its way to under US$45 at the time of reporting. Similarly server RAM oversupply has affected the market, in this case even more severely as it is expected to see a price decline of nearly 30 per cent QoQ. All the above talk of contract and spot prices of DRAM might seem a little detached from what we actually pay for PC memory modules. Therefore it is worth a look at the trends on sites like CamelCamelCamel, which back up the analyst charts, and trends. 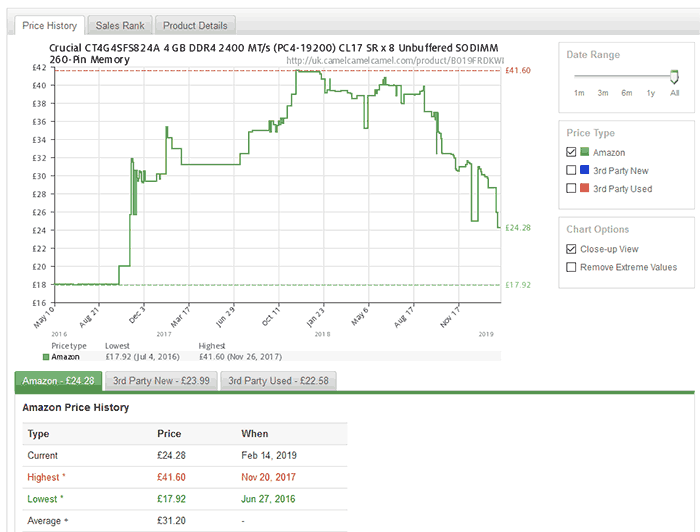 For example, here in the UK, Crucial 4GB DDR4 2400 MT/s memory modules are at their cheapest price since October 2016, at £24.28. I also checked out the Corsair Vengeance LPX 8GB DDR4 2400MHz C16 module pricing. As you can see that is also trending nicely for would-be buyers at £48.62. Again, this is probably the best pricing we have seen for these modules since October 2016. Should you therefore wait a little longer if you are thinking about upgrading your PC RAM? According to the TrendForce analysts, it would seem like the answer to that is yes. No advice intended, remember 'stuff' happens, and the GBP could move very strongly one way or another in the coming weeks, for example. Shhhhh be quiet about that, before they wake up and inflate the prices again! prob due to the Chinese government looking into to them .. and shaking a big stick .. It's normally around now that one or more plants suffers some sort of major disaster and prices rise again isn't it? My moneys on a fire. Completely accidental of course. Nah, floods have been the cause of the last two artificial inflations; this time will be because of nuclear fallout. Totally believable right? right?